According to some, the Leader of Swindon Borough Council has lost the plot. I don’t know about that but his latest lecture is definitely wackier than usual. It doesn’t just border on the delusional, it has torn the door off the customs shed and stamped the officials inside to death before making off across a mental landscape which is, thankfully, quite unfamiliar to most of us. Does Rod Bluh think he is telling telling the government what to do?, and does he think it is listening to him? Highlighting what to whom?, Bluh has been a bit quieter than usual and, although I’m sure many people have welcomed the break from his constant narcissism, it has to said that comments have been made by civic leaders, (non political ones), about an ‘absence of leadership’ at the council. Bluh both explains his recent absence and forewarns us that he’s once again impatiently ‘going it alone’, although in this instance it’s central government he’s not waiting for before charging off into the distance whereas last year it was 57 Swindon councillors he ignored before charging off into the distance. Yes dear, of course you are. Every town in Britain has a ‘unique geographical position’, and that’s a jolly lucky thing because having Manchester and Swindon sharing the same geographical position would undoubtedly mean that I would be forced to have gravy on my chips by those philistine bastards. First he was convinced a canal would achieve the same objectives, now he’s graduated to railways as the cure for all Swindon’s ills. Tune in again next week as Rod discovers and explains the benefits of the internal combustion engine and metalled roads. Don’t thye always put the ‘weenies’ on first? and how many delegates remember the first thing they hear at conferences? Bluh doesn’t devolve anything downwards except blame and problems. He regards everyone else as being beneath him. Bluh’s ‘Connecting People, Connecting Places’ schemes is failing because he’s not capable of leading it effectively precisely because he is fundamentally incapable of trusting other people to do it themselves, i.e, without his ‘help’. He may think he is a ‘transformational leader’, but in reality he’s a narcissistic middle-manager who has ‘done the course’ and thinks he’s the expert. Bluh increasing sounds like a travelling Snake oil peddler. His lectures are stuffed full of dubious claims, boisterous marketing hype and his ‘key message’ that: “Only he has the cure for Swindon’s multiple problems”. In past times a successful Snake Oil Salesman would prudently leave town before his customers realized they had been cheated. Here in Swindon his council-tax paying ‘customers’ are realising that he causes more problems than he is ever capable of curing but Bluh shows no sign of acknowledging his inability to deliver cures, in fact down at the civic offices tonight, he is going to unveil his latest panacea for Swindon’s ills, the ‘One Swindon’ initiative, which appears to be a ‘Rodicalised’ version of David Camerons ‘Big Society’. 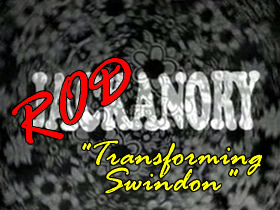 Expect the big press release in the Swindon Advertiser any day now….